Disclaimer: if you try any of these processes you do so of your own accord and I hold no responsibilities for any damage caused to your property. 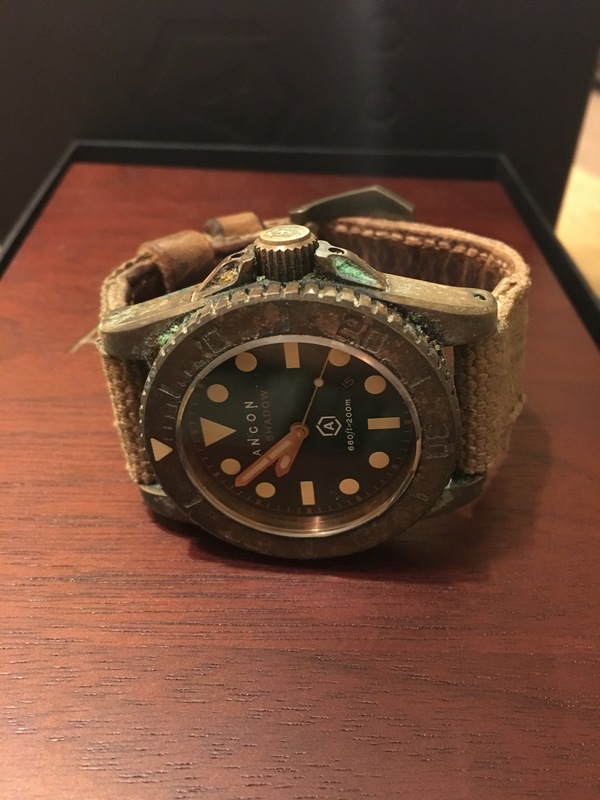 I decided that I wanted to experiment with bronze patinas, actually I decided I wanted a bronze watch for my collection, and I wanted a certain look to it, I also wanted to do this on a budget. 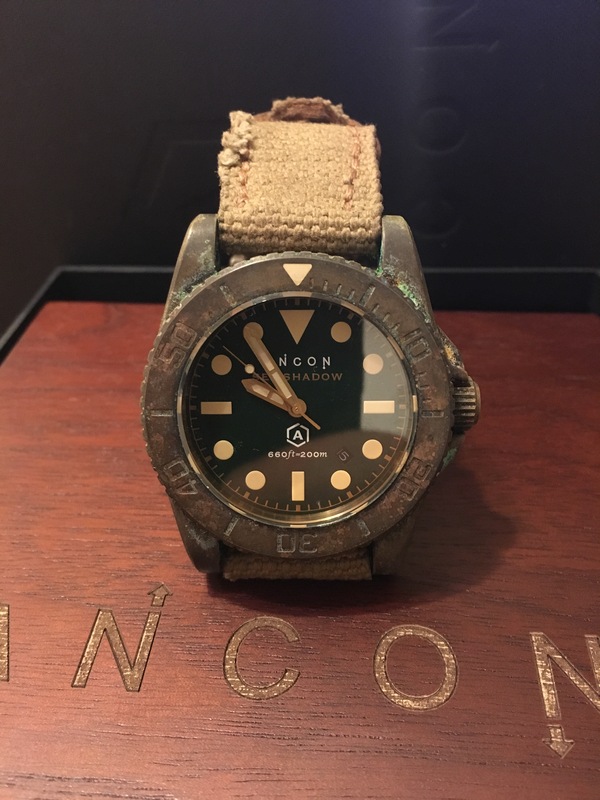 A half decent bronze watch will set you back somewhere in the region of £300 – £700, but I was fortunate to come across an Ancon Sea Shadow on “The Bay” for the lower end of the scale, and one bid secured it. 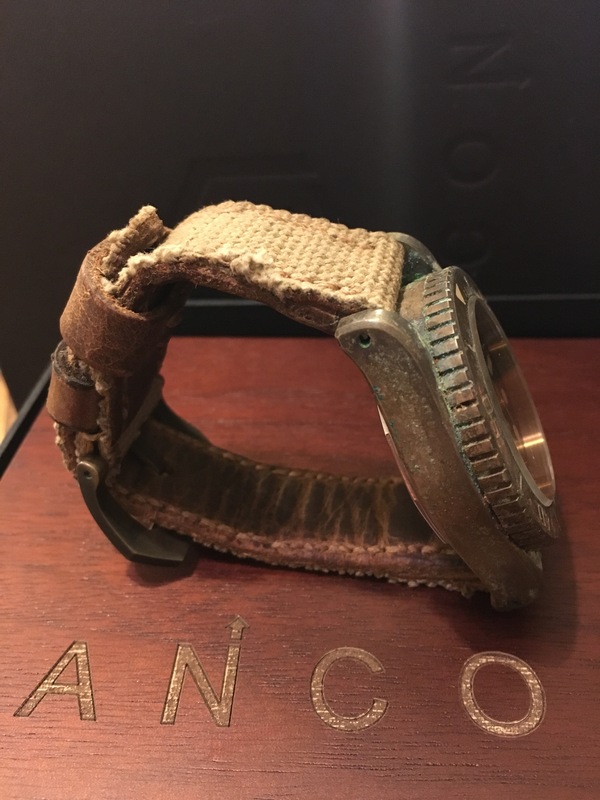 My first impression of the Ancon, and also my first microbrand purchase, was that it is a very well built sturdy watch, great looks, the leather strap is a nice quality, but the NATO strap seemed a bit low end, and for this reason had never been out of the box, so it appeared I was not alone in this opinion. 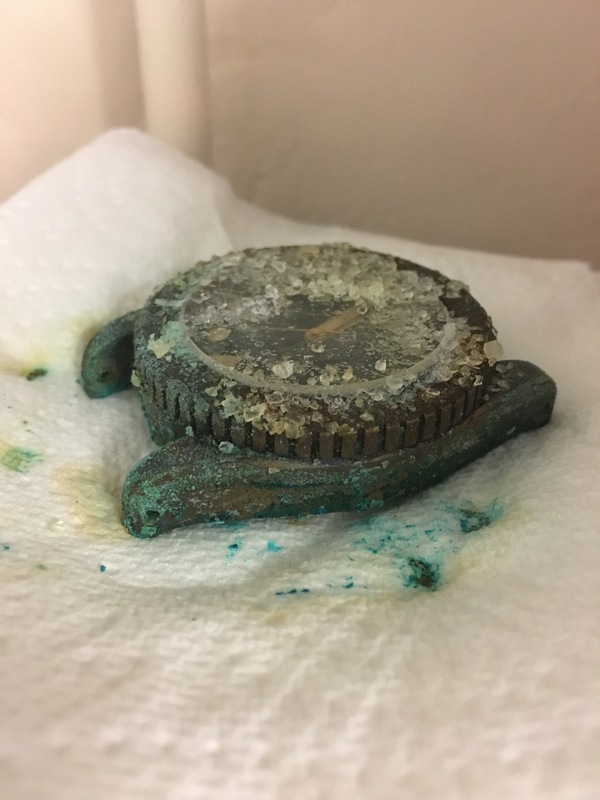 The watch already had the start of a natural patina as can be seen in the picture, but not close to how I wanted the watch to look “recovered from the ocean” or “Badass”. 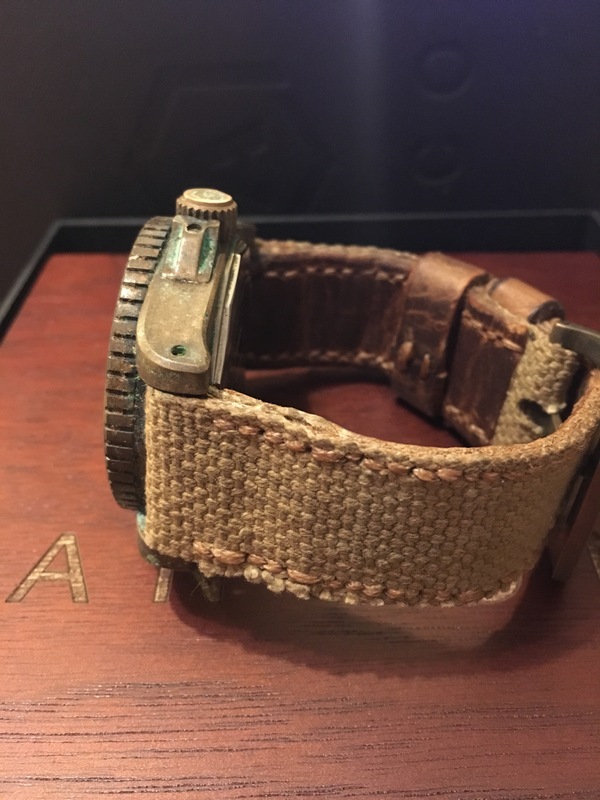 Two things were going to be needed, the watch with the right look, and a strap to compliment. 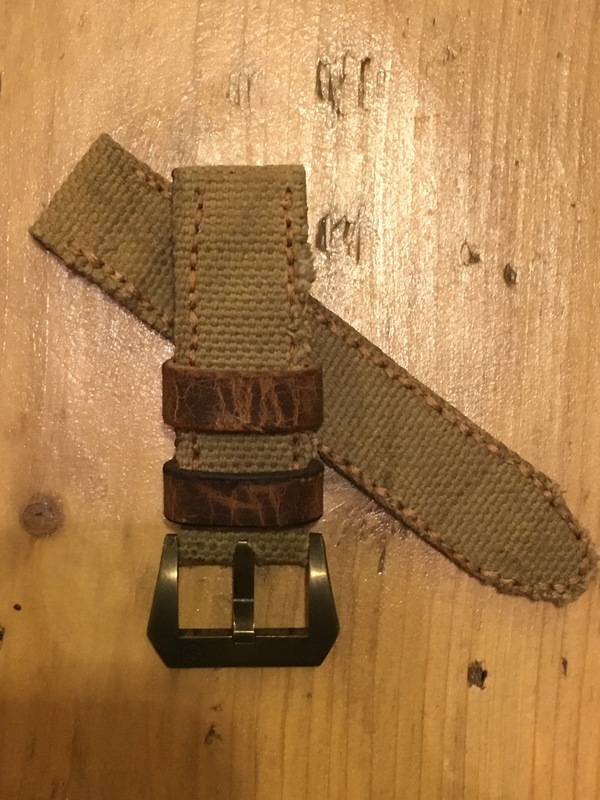 I had an idea about the strap style, but shopping around gave me figures of £60 for the style I wanted, so I decided the project would need me to make a strap as I had most of what I needed, and what I did not have only cost a few pounds online “1940’s 37 pattern webbing”. 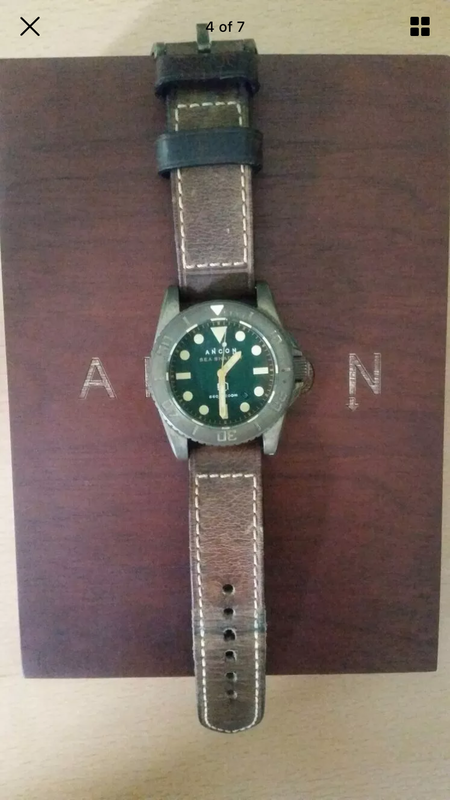 The first patina process I tried was liver sulphur in hot water, but it does take a certain mentality to drop a watch you have bought into a container of water and solution, even if it is a diver rated to 200m. Liver sulphur likes the metal to be clean before use, so it has to cleaned with a detergent solution to remove the oils from human contact first, and then rinsed. 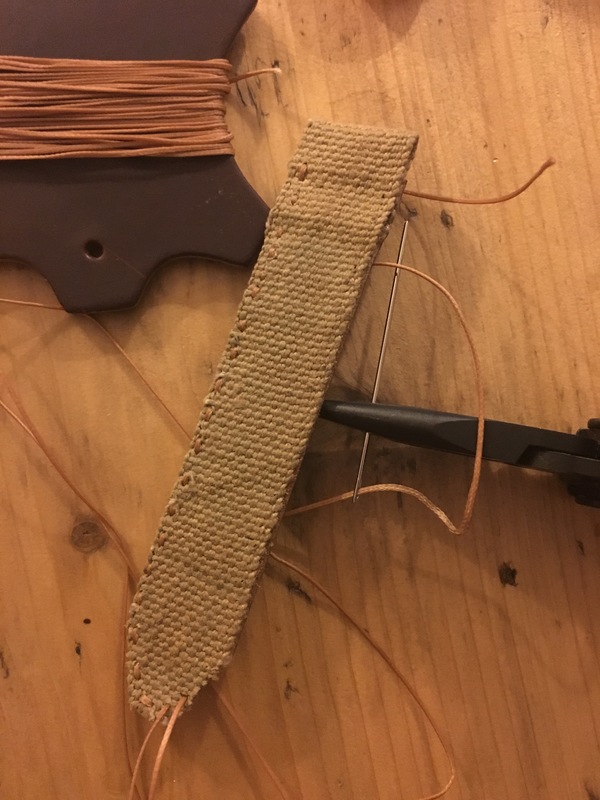 The solution darkened down the bronze further, but when it came out any hint of green was now gone. The green tones were important for my look, so further research started, but most research pointed to boiled eggs or liver sulphur, or chemicals that would need purchasing. 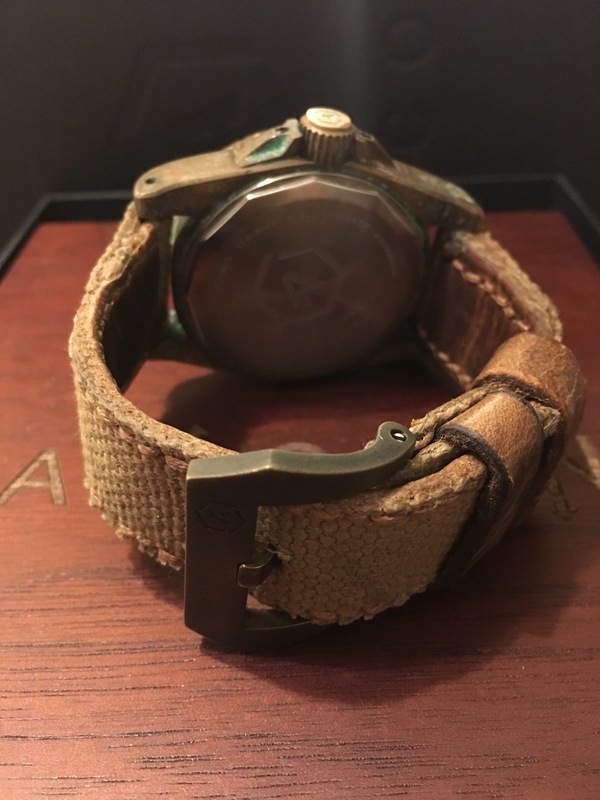 It dawned on me though that the green tones reminded me of copper aging, eventually the penny dropped that it was the copper content in the bronze that I wanted to react. Some more research later I came across the proposal of a white vinegar and salt solution, this also made sense because of the nature of diving helmets being in salt water, so it was worth a try. Thanks to my love of Greek salad I had white vinegar, and made a solution that was as much salt as it was vinegar, highlighted by the refusal of any more salt dissolving. 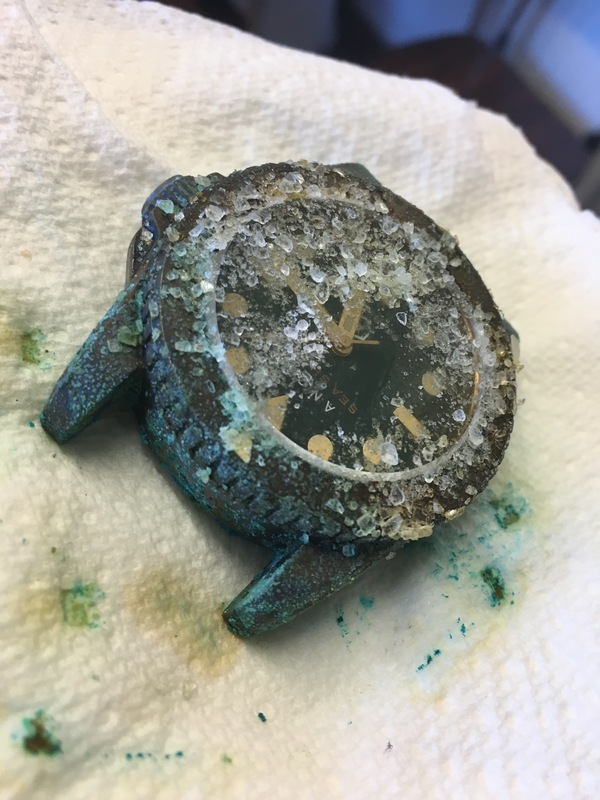 The process was simple, half an hour in the solution, then gently remove the watch, do not remove any solution, leave to dry, and let the contact to the air do its work for 24 hours. 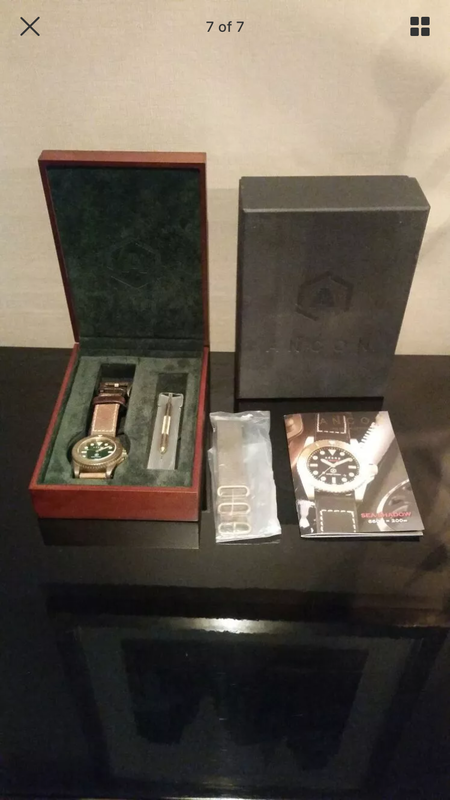 It would make an interesting time lapse video. 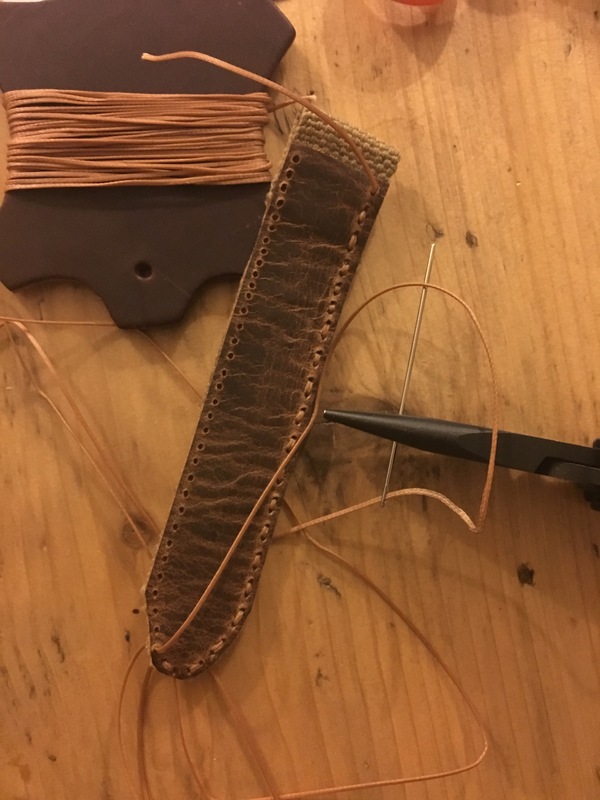 I liked the result but wanted more, so I prepared fresh solution and went again. 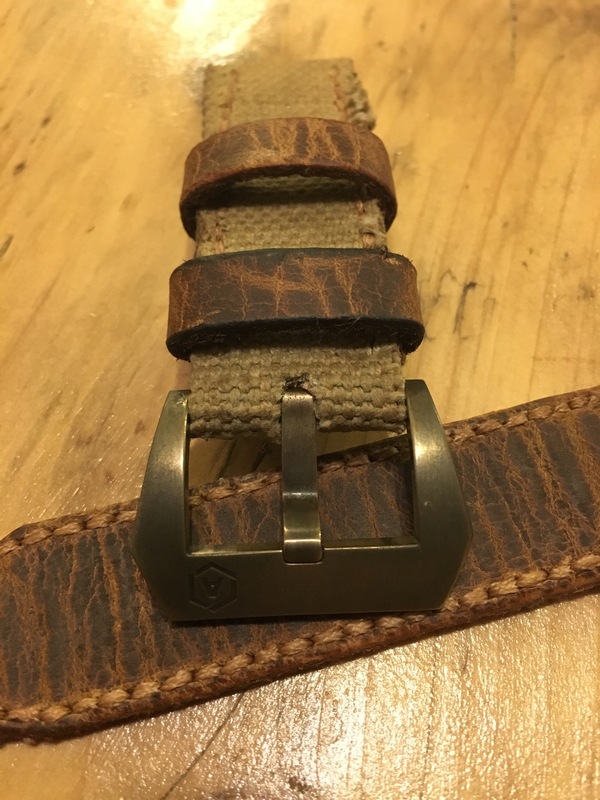 The two day wait also gave me time to make the strap from the webbing and Horween leather. Most people like the result, some do not, but that is what life is about, opinions and choices. 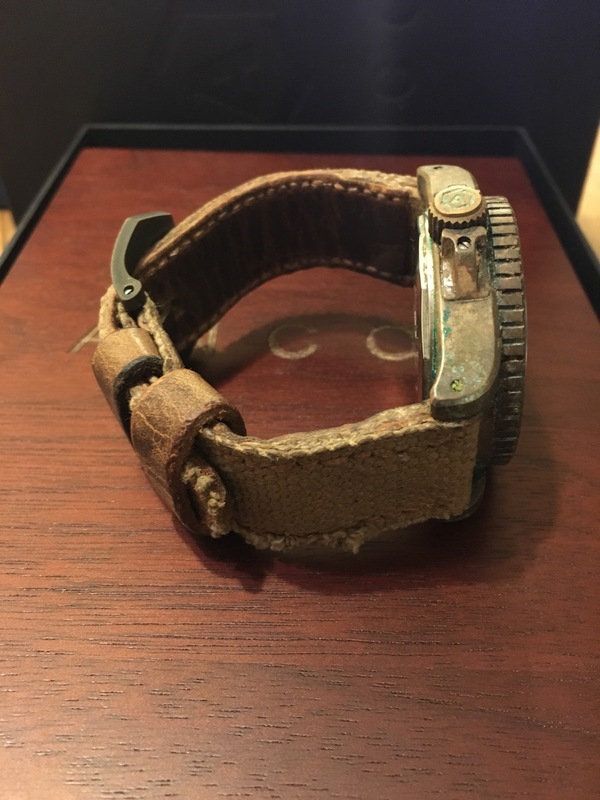 As for the watch, I feel the patina will develop further.